With its soothing mix of herbal and floral ingredients, Tazo Calm Chamomile Herbal Tea invites your guests or employees to indulge in a moment of tranquility. This comforting caffeine-free tea is an herbal infusion of chamomile, hibiscus, rose petals, spearmint, and herbs. The mild tea soothes the senses with its gentle floral flavour and aroma. 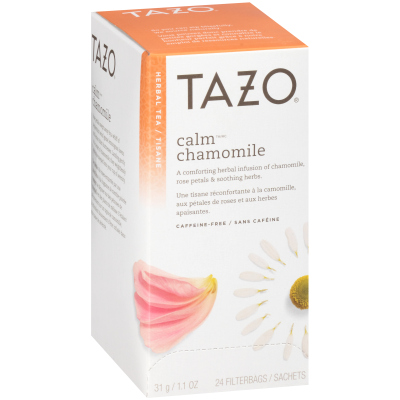 Ideal for restaurants, cafes, hotels, and office environments, this package includes six boxes of 24 individually wrapped bags of Tazo Calm Chamomile Herbal Tea. Whether you're an office manager looking to ignite the creativity of your workforce, or a café owner in search of a deliciously unique flavour offering, you will love serving this blend that inspires relaxation with every sip.